The 76th Carnival of Nuclear Energy is up at Next Big Future. Brian Wang has put together a great carnival. With movies! Will Davis at Atomic Power Review has posted an enlightening set of Japanese videos on Fukushima, and Brian put several of the videos directly on the Carnival. Another fascinating post: Rod Adams reviewed the PBS special on Chernobyl, Radioactive Wolves. His review was insightful, thoughtful and controversial. The post has over 150 comments as people argue the validity of the Linear No Threshold theory. The comments are well-thought out and occasionally acrimonious. Fun and informative. I am at ANS Winter Meeting in Washington D.C. Many important people are here (for example, NRC Chairman Jaczko). For me, the most important people here are people I have met on-line that I am finally meeting in person. Margaret Harding. Dan Yurman. Laura Scheele. Ulli Dechter, Steve Skutnik, Jim Hopf, David Mohre, Paul Bowersox. Also, it is wonderful to see people whom I have met before but see very rarely: Fritz Schneider, Jackie Clark, Rod Adams, Gwyneth Cravens. It is a wonderful experience for me. Howard Shaffer and I gave a luncheon talk, the Green Bag luncheon. Dan Yurman has two posts at ANS Nuclear Cafe that mention or describe our talk. Hall Talk November 1: Vermont, Do You Know Where Your Electricity Comes From? Interesting comments from people who don't live in Vermont, on the Vermont situation. I hope to blog more about this convention in the future. Comments on the Vermont Energy Plan. Comments due by November 4. The comment period for the Vermont Energy Plan has been extended until November 4. I will be at the American Nuclear Society Winter Meeting for the next few days, and I won't be posting very much. So...here's some help for commenting! You can continue to comment on the Vermont Comprehensive Energy Plan through November 4. Unfortunately, the plant is so long (600 pages), so internally inconsistent, and so lacking in numbers (costs, for example) that commenting is difficult. However, in another way, it's easier. For example, you could just say it doesn't work as a plan, and it doesn't work for Vermont. The plan can be vague and you can be vague! Okay. Being vague is a bad idea. Here are some blogs and articles that can help you define your comments. You can use the following email address to comment. I explore some of the problems, including the gas pipeline. Geoffrey Norman asks: what's the rush? Milton Eaton notices the lack of cost information. Art Woolf: Mercantilism won't work. I explain that depending on biomass for baseload would be a bad thing. As well as impossible. The rally in support of Vermont Yankee went very well. My post at ANS Nuclear Cafe. 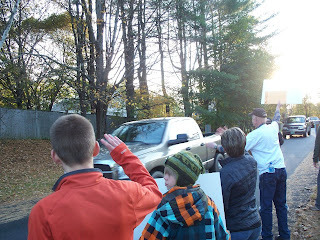 Susan Smallheer had an excellent article in the Rutland Herald: Vermont Yankee Supporters Hold Rally. However, it is behind a paywall. Finally, a sing-along! Gail H. Marcus, former president of the American Nuclear Society (among other achievements and honors) wrote These Plants Are Your Plants. She posted the lyrics on her blog, Nuke Power Talk. She has written other songs, too, like Neutron Doodle. Marcus was inspired to write nuclear songs by the way the depression-era hydro projects were encouraged by songs. The best song was Roll on Columbia by Woody Guthrie: "Your power is turning our darkness to dawn." These plants were made for you and me. These plants are good for you and me. These atoms split for you and me. These plants bring joy to you and me. Warning: The verses about the hydro projects and the river locks (for navigation) are terrific. However, some of the Guthrie lyrics are very distasteful. The "wild Indian warriors"? Ouch. We forget how prejudice was part of standard speech, back in the Good Old Days. Many of the posts are about nuclear communication, including Suzy Hobbs on a Facebook debate with celebrity Christie Brinkley. Yes, Ms. Brinkley considers herself an expert on the dangers of nuclear energy. Brian Wang wonders how wrong Armory Lovins can be, over the years, and still be considered an expert. (The jury is still out on that one). ANS Nuclear Cafe features stories of mothers in the nuclear industry. Steve Skutnik of the Neutron Economy acknowledges the fear that civilian nuclear development is a cover for more warlike intentions, but that is not how things really happen. This is a very enjoyable Carnival! I have spent the past two days assisting Howard Shaffer in planning the Rally at the Plant. 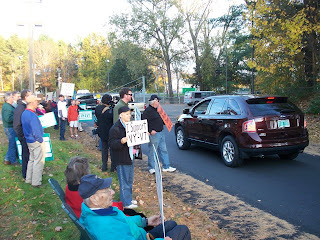 Fifty people came to show their support for Vermont Yankee. We came at shift change. As cars went by, we held signs, waved, and encouraged the people who are working the refueling outage. They get a lot of negative feedback, what with the anti-nuclear puppet shows and all. We wanted to be sure to give them some positive feedback. After all, they supply our power! I will blog about this more in future days. but for now, I will just link to the Brattleboro Reformer article about the rally, and include one picture I swiped (with permission) from the Vermont Yankee Facebook album. The man sitting on the chair is 92 years old, and came out to support the plant. The rally included children, workers, tavern-owners, and retirees. It was a great family occasion! Vermont Yankee is holding a refueling outage. They are moving ahead to keep that clean electricity flowing, despite the uncertainties of the court case. Many of us appreciate that, and we are holding a rally at the plant gates tomorrow afternoon, at 4:30 p.m., shift change. We want the people at the plant: regular employees, contract workers, and managers who made the decision to load fuel...to see we support them! More details in the previous post, which includes email addresses and phone numbers to reach the organizers: Howard Shaffer and me. On the morning of September 12, the Entergy versus Shumlin/State of Vermont lawsuit began in at the Courthouse in Brattleboro. Early that morning, the Safe and Green Campaign held a vigil in front of the Court House, and several pro-nuclear groups held a rally. The pro-nuclear groups included the Energy Education Project of the Ethan Allen Institute, and the Vermont Pilot Project of the American Nuclear Society. I am director of the Energy Education Project, and I blogged extensively about our rally. The morning vigil and the rally were not the only activity on September 12, however. In the evening, at 6 p.m, the Clamshell Alliance held a protest at the gates of the plant in Vernon Vermont, a few miles from Brattleboro. The protest featured a Puppet parade, radical marching band, street theater and direct action. At first, I read nothing about that protest in the press. On the evening of September 12, all the reporters who cover Vermont Yankee were busily filing their first-day-of-the-Federal-trial stories, not racing to the plant to see yet-another-opponent-demonstration. The evening protest did eventually get covered in the press. Obliquely. During the September 12 protest at the plant, people parked across the street from the plant at the Vernon Elementary School. As the Brattleboro Reformer wrote on September 28: The Vernon School Board is weighing a new ordinance to prevent non-school related parking on the property after receiving several complaints following a recent protest against the Vermont Yankee nuclear power plant. Board members said Monday night that protesters, gathered at the plant’s gate just across the street from the school, were using the parking lot for unauthorized purposes. On October 5, the protesters showed up in the press again. Susan Smallheer at the Rutland Herald (behind a paywall) wrote that (A) group of protesters, who were arrested for the first time at Vermont Yankee’s gates on Sept. 12, are due in court later this month. A call to the Vernon Police department revealed that the arrests were for trespassing on Vermont Yankee property. Apparently, puppet shows and direct action lead to problems in the parking lot and arraignment in court. In my opinion, the parking ban will pose a bigger difficulty for the plant opponents than the trespassing charges. The Clamshell Alliance is going to be holding a rally at the plant on October 30. Here are notes from one of their recent planning meetings. 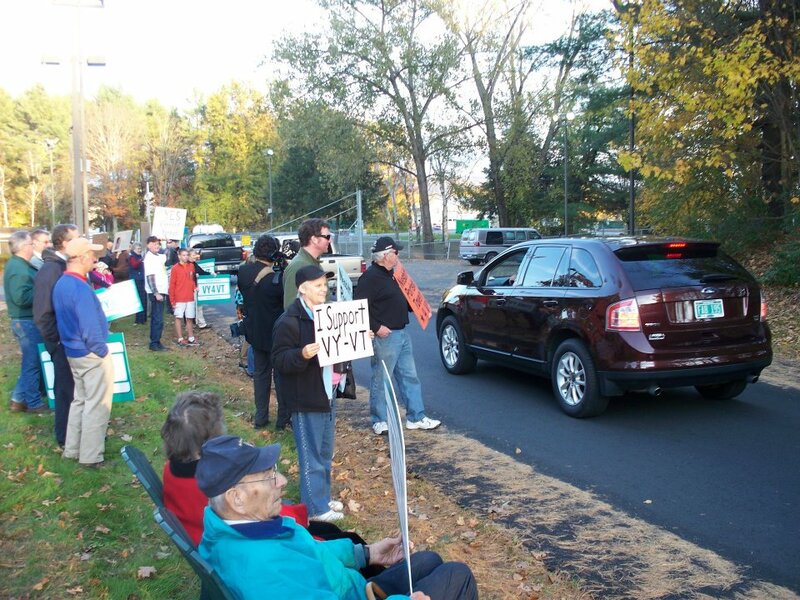 On Sunday, October 23, from 4:30 – 6:30 pm outside the front gate at Vermont Yankee, there will be a rally of support for the plant staff and the outage team. "The people working the outage will appreciate our support," said co-organizer Howard Shaffer, coordinator of the Vermont Pilot Project of the American Nuclear Society. "We are grateful to Entergy for giving us permission to be at the Governor Hunt House for the rally." This is a press release I sent out earlier today. 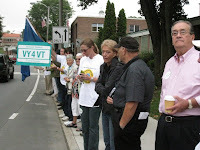 Last time we held a rally, we were in downtown Brattleboro near the Federal Court House. This time, we wanted our rally to be visible to people at the plant. About the Governor Hunt House. It was built in 1789 by Governor Hunt, who was the last Lieutenant Governor of the independent Republic of Vermont. It is now near the gate to Vermont Yankee. Vermont Yankee is in the middle of the much-discussed refueling outage: Would they or wouldn't they load fuel? Nobody knew for sure. Vermont Yankee is loading fuel. They are doing it. Hundreds of people are working hundreds of hours. Sometimes it feels like each individual person is working hundreds of hours. I decided to honor everyone working the outage at Vermont Yankee with Songs for An Outage. The first song: Fifty Ways to Save a Millirem, was on my blog before, on the post, Vernon, New Hampshire? (That post suggested that Vernon secede from Vermont.) Here's the song again. Here's another song, Don't Stand So Close, this time by the Rad Police (as opposed to The Police). I can't make out some of the lyrics, so if someone can hear them more clearly, please send the lyrics as a comment to this blog. Have a great Refueling, Vermont Yankee! On October 11, the ILEAD Energy Safari Class visited the new Life Sciences Building at Dartmouth, to see Energy Conservation as well as Energy Production. As usual, Robert Hargraves has an excellent blog post on our visit. Our tour was led by Joe Broemel, senior project manager at Dartmouth, and Ken Merrow, project manager at Trumbull-Nelson, a construction company. They were knowledgeable and very patient. They had to be patient, because we asked so many questions. The building is beautiful, and one of its most lovely features is its careful management of run-off rainwater. Roof gardens help cool the building, and a rain garden (shown above right) is part of the run-off-capture system. Captured rainwater will feed the toilet water, the Reverse Osmosis/Deionized Water system that provides lab water, and cooling tower make-up water. The run-off system is expected to save one million gallons of water a year. Another beautiful feature is the use of daylight lighting when possible. The labs have large windows, providing daylight deep into the lab space. Adjustable lighting makes up for cloudy weather, rather than the "lights on/lights off" format of most buildings. I thought back to some of the labs I have worked in during my life: well, they just seemed squalid in comparison! It was a truly gorgeous, energy-efficient building, but it seemed to be such uphill work to make it efficient. For example most energy-efficient buildings have a tight building envelope, and aim at three air exchanges per hour for ventilation. 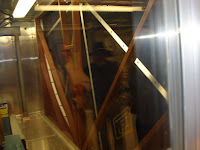 This building also has a tight envelope, but the labs require twelve air exchanges per hour for safety. 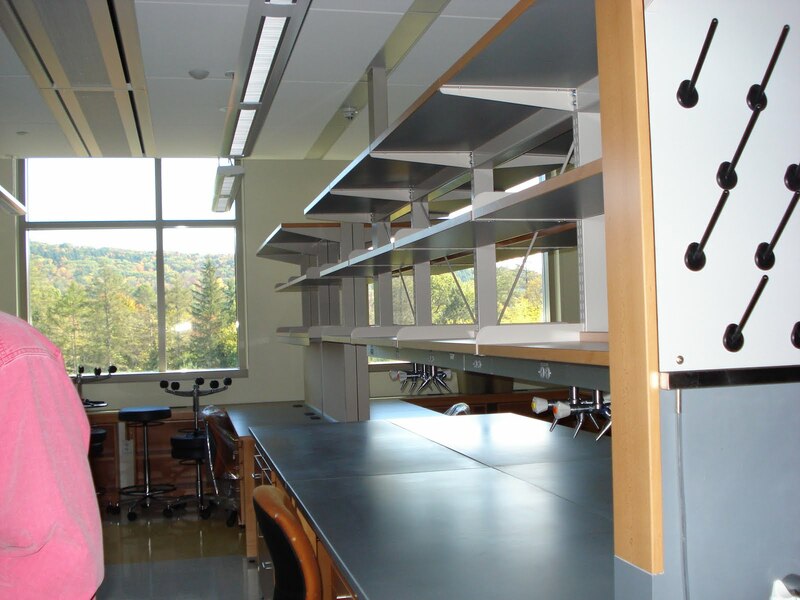 That twelve-exchange figure does not include the air exhaust demands of the fume hoods: each square foot of fume hood opening requires 100 cubic feet per minute of air flow to protect the workers. The building deals with the air-exchange problem well, with an enthalpy wheel (air-air heat exchanger) to capture much of the heat from the air the building needs to vent. The enthalpy wheel is shown at left. (I am not sure how big it is, but it seems about two stories tall.) Enthalpy wheels are a relatively new technology, capable of recapturing 80% of the heat in outflowing air. They also control humidity, and they keep the indoor atmosphere pleasantly humidified. Indoor humidity becomes important in below-zero weather, when the dry air inside a building can lead to cracked skin and nosebleeds. I think enthalpy wheels can make an important contribution to energy conservation. They are used in other buildings on the Dartmouth campus. However, somehow, I was not as happy with the whole thing as I might have been. All those air exchanges, for example. The building has a very tight envelope, but inside it has has fume hoods and rapid air exchanges in the lab space. I wasn't sure that the carefully built envelope and triple glazed windows were important, considering all the air exchanges. On the other hand, the enthalpy wheel at least mitigated the exchange problem. Let me first admit I am being completely unfair. The Life Sciences Center is wonderful. It is well designed, and will be an ornament to the Dartmouth campus for at least a century. It has a pleasantly "organic" feel due to the roof gardens, the sweeping views from the large windows, and the use of local wood in the interior design. It's really a marvel. So, what was my problem? I guess I wish more local buildings had simple efficiency retrofits, rather than this one shining example of every possible type of energy efficiency. If I think of the building as an experiment, then I love it. It shows what can be done. If I think like an energy-committee member (which I am), I can't help but worry about cost-effectiveness. Still, the world needs shining examples as much as it needs insulated walls in modest homes. This building certainly is such an example, and I am very grateful for Dartmouth for arranging our tour. The 74th Carnival of Nuclear Energy Bloggers is up at ANS Nuclear Cafe. Dan Yurman did a great job of putting this Carnival together. Gail Marcus of Nuke Power Talk used to live in Tokyo. One of the unintended consequences of the post-Fukushima monitoring has been the discovery of an old cache of radium-containing luminous paint. The paint was stored beneath the floorboards of a house near where she lived. The paint was the cause of a "hot spot far from Fukushima." Comic relief about Fukushima, but also, good that they found it, because storing such radioactive material in the basement of a dwelling is definitely a bad idea. Will Davis of Atomic Power Review continues his reporting on Fukushima clean-up. Following his posts are among the best ways to follow that situation and its mitigation. At Yes Vermont Yankee, I describe Dr. Swartz of Dartmouth's engineering seminar: "If Vermont Yankee had an accident like Fukushima." As Dr. Swartz explained, the problem in such a case would not be radiation sickness or increased cancer risk, the problem would be the actions of the "worried well". "Worried Well" people would not accept reassurances that they are not in danger, and might take actions (evacuating, taking KI tablets) as if they were in danger. Meanwhile, dialogs are happening, and they are very interesting. Dan Yurman organized the major dialog: Chairman Jaczko of the NRC answered 50 questions (asked by Yurman) in a ninety-minute unscripted webinar! Now THAT's communication! Read about it at CoolHand Nuke. On his own blog, Idaho Samizdat, Yurman is engaged in a dialog with New York Times Op-Ed writer Stephanie Cooke, who has a rather dim view of the nuclear future. In my opinion, she is no match for Dan's knowledge. Rod Adams at Atomic Insights notes that the Main Stream Media always quotes the usual list of viewers-with-alarm about Oyster Creek. However, a poll attached to to a recent article shows that 95% of the local people want to see Oyster Creek continue to run. Maybe the media should engage in a dialog with their readers? 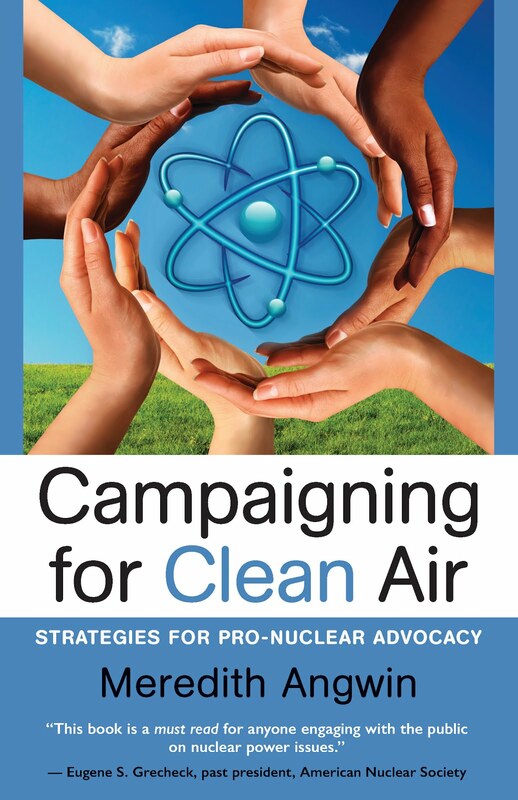 In the ANS Nuclear Cafe post, the Pro-Nuclear Community Goes Grassroots, Suzy Hobbs of PopAtomic describes the process of pro-nuclear petitioning at the federal level. Hobbs doesn't just describe the process, she provides links so you can sign the petitions. Meanwhile, Cheryl Rofer and friends have started a wonderful new blog, Nuclear Diner, a place for discussing nuclear energy from all points of view. A new place for dialog! Brian Wang of Next Big Future describes the Small Rugged Reactor Liquid Fluoride Thorium Reactor that the newly-formed firm, Flibe, will build for the military. This new type of reactor is truly good news for the nuclear industry. I also recommend Michele Kearney's Nuclear Wire post on this subject, which has several useful links about the LFTR and Flibe. It's a glorious day for a Carnival! Come and see the attractions. Join in the dialogs, or just watch them! This a great Carnival, and you won't want to miss it! On Friday, October 7, I attended a Jones Seminar at the Thayer School of Engineering at Dartmouth College. The Jones Seminars are open to the public, but mostly attended by engineering students. This seminar, but Harold Swartz of Dartmouth Medical School, had the provocative title: If Vermont Yankee had an incident like Fukushima, What Would be the Responsibilities and Public Expectations of the Scientific Community? 10 Kilotons in Washington D.C.
Dr. Swartz's area of scientific inquiry is after-the-fact dose measurement, and he started the seminar with a description of an improvised nuclear explosive device going off in Washington D.C.. (Parenthetically, he said it would be easier to buy a bomb than to make one.) At that point in the seminar, since I knew Dr. Swartz is a medical specialist in radiation dose measurement, I wondered why he had titled this talk anything about Vermont Yankee? Vermont Yankee cannot be a bomb, either improvised or purchased. But as the talk continued, I realized his reasons. He described the casualties of a bomb and the non-casualties of Fukushima in a masterful way. I recommend his talk highly. It is scientific, direct and reassuring. Dr. Swartz basically said that in the real events of Fukushima, or the theoretical events at Vermont Yankee, the "worried well" are the major issue. Civilians will not experience exposure at a dose which would measurably increase their chances of getting cancer or limit their life-expectancy. At the same time, they will not believe any official reassurances that "everything is okay." It would be the duty of the scientific community to explain that people are not in danger of cancer or early death. In other words, it would be the duty of the scientific community to reduce one of the major public health effects of any type of accident: fear and anxiety. On October 4, the Energy Safari class visited Springfield Power LLC, a wood-burning power plant in Springfield New Hampshire. The plant is very visible from Interstate 89, at Exit 12A, Georges Mills. It is rated for 19 MW, and usually makes that amount. As usual, I recommend Bob Hargraves excellent blog post on the visit. His post contains videos of logs being fed into the chipper, chips on a conveyor belt to the silo, and a semi-truck load of chips being emptied into a chip pile, from which they will be loaded into the conveyor belt. (I include that video below.) 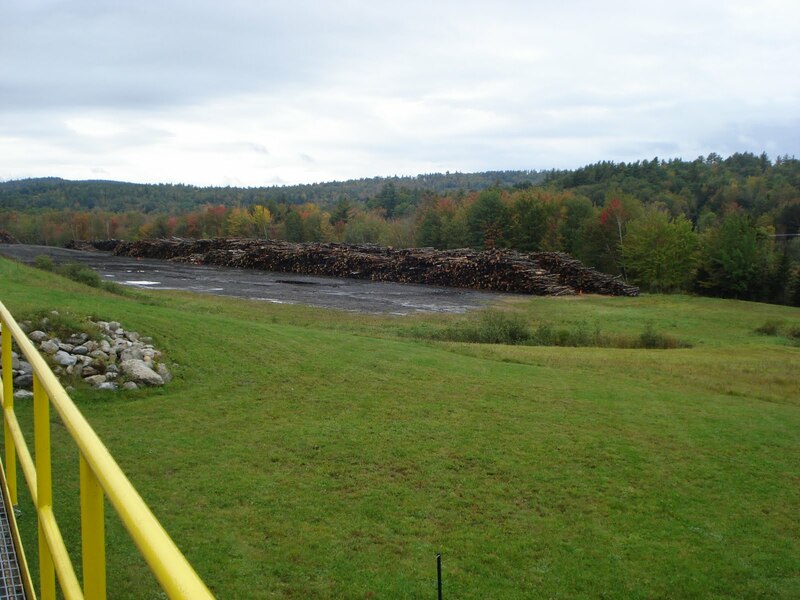 The plant buys about one-third of its wood as logs and chips them on site. The other two-thirds of its fuel is purchased as chips. They use trees that are not good for other uses, such as furniture or firewood.Most of the trees they use are small pines. This is the first powerplant I have every visited that smelled wonderful, like a Christmas tree or a pine forest. Nothing like having tons of pine chips around for a truly pleasant odor. The plant burns 200,000 tons of wood chips per year. Our host, Chuck Theall, was incredibly patient and completely knowledgeable. I include one of Bob's videos. Okay, I admit it. I was very comfortable in this environment, because it was a "regular" power plant, and Theall is a man who was in the Nuclear Navy. Somehow, I expect power plants to be run by Nuclear Navy people. Shows something about me, I guess! 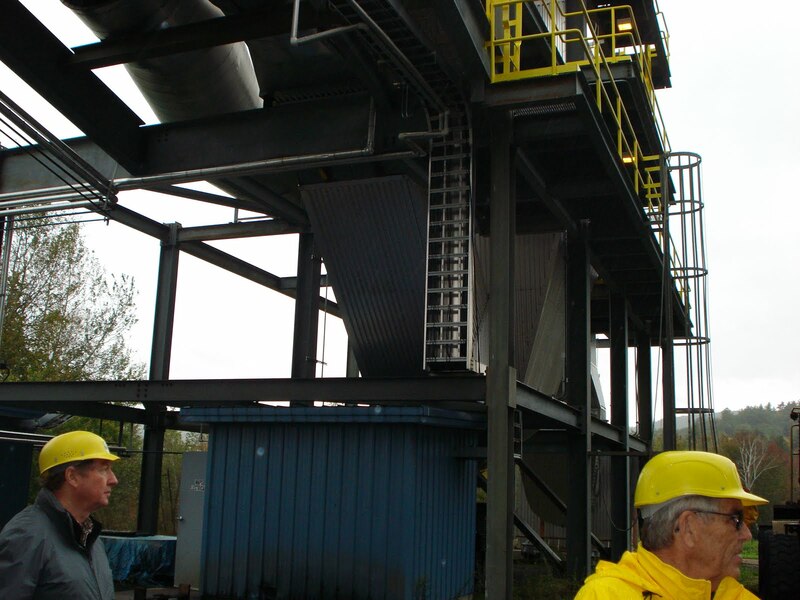 This wood chip plant is a heat engine, which means they have to keep fuel on hand. The picture below shows their current log pile, which is about two weeks supply of logs. During mud season, there are weight limits posted on the local roads, and logging trucks have a hard time traveling. Theall builds up a six weeks supply of wood and chips in preparation for mud season. I found the fact that this plant keeps running very reassuring. The exact figures are proprietary, but Theall said the plant gets paid about 5 cents/kWh, but his fuel costs are about 4 cents/kWh. These are in the price range of power from other types of plants, unlike the 24 cents and 30 cents/kWh of the solar farm, for example. Theall said that the sale of RECs (Renewable Energy Certificates) was an important part of the plant's ability to be profitable. He also pointed out that all the plant's fuel expenses are paid out to local people. The money goes right into the local communities, to loggers, land-owners, and their families. Every day, the plant tells ISO-NE (the grid operator) whether it is on-line or having a problem. 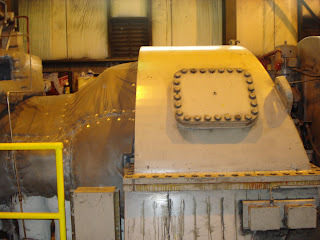 (It is usually on-line, with one or two weeks off per year for inspection and repair.) After that call to ISO-NE, the plant contracts to supply a certain amount of power to the grid that day. If it can't supply that power, it has to pay ISO-NE for replacement power. I found this type of contract and requirement a change from the discussion of capacity factors (14% at solar, 35% at wind) in the other facilities. The plant has excellent pollution control equipment for fly-ash and NOx. 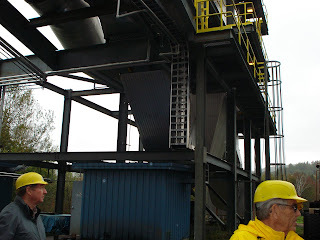 Electrostatic precipitators catch the fly-ash: you can see the big ash-hopper below. The ash is sold as a soil amendment. It brings alkalinity and minerals to the soil. They also sell tree-bark to landscapers. The plant burns hot (1600 F) enough to make some NOx. It controls NOx with a selective catalytic reduction control system with an ammonia feed. I could include a picture, but I think a picture of a tank of anhydrous ammonia is somewhat boring. I was impressed by the plant, by the pollution control equipment, by professionalism of those who ran it, by the sweet smell of pine. Alas, I was more surprised than impressed by the turbine hall. It's a perfectly nice turbine, but it is only 19 MW, which looks tiny to people like me who are used to coal or nuclear plants. At twenty MW, it would take 31 plants like this to make as much power as Vermont Yankee. This is a serious, well-run plant that lives up to its committments to supply power. It is a benefit to its community and I am very glad I visited it. All in all, I got a very positive impression of biomass. While those in the ILEAD class are serious about getting reputable information in an industry in which misinformation abounds, one draw of the class is likely the field trips. As Hartford resident Meredith Angwin summed it up: "I just like power plants." It's true. I like power plants. I like electricity. I feel privileged to have spent so much of my lifetime in the electricity business, which is so important to human health and happiness. All pictures are my own. Video from Robert Hargraves. The comment period on the Comprehensive Energy Plan has been extended until November 7. The original comment period ended on October 10, that is, on Monday. On the heels of a request from Vermont Energy Partnership and queries from regional planning commissions and the Vermont Public Power Supply Authority, the department extended the comment period by nearly a month. Public comments will now be accepted through Nov. 4. Commissioner of the Department of Public Service Elizabeth Miller said the new comment deadline will push the tentative date for the presentation of the plan to the beginning of December. And, while we're talking about Vermont Digger, I would like to point out that they published my op-ed about the Energy Plan: The Governor wants a plan--without Vermont Yankee. Feel free to read and comment on my op-ed! The good news is that we have another month to review this 600 page plan. Or maybe, that's the bad news. Update: Howard Shaffer has an excellent post at ANS Nuclear Cafe this morning about a nuclear opponent from India who was hosted at Vermont Law School. People at VLS are also planning a demonstration at Vermont Yankee. The 73rd Carnival of Nuclear Energy Bloggers is up at Next Big Future. 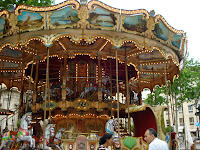 Brian Wang has put together a great Carnival of world-wide reach! Brian Wang of Next Big Future has started a White House Petition for better nuclear education. Dan Yurman of Idaho Samizdat asks whether the Texas reactors are Texas Toast. At Yes Vermont Yankee, I question the Comprehensive Energy Plan for Vermont without Vermont Yankee. Steve Skutnik of Neutron Economy explores the physical and political limits for spent fuel repositories. Gail Marcus of Nuke Power Talk takes a look at coal and gas, pollution-wise. Steven Krivit, of ANS Nuclear Cafe, points out that we were once terrified of fire, too. Will Davis of Atomic Power Review discusses the blast at Fukushima Unit 2: Tepco says it wasn't a hydrogen explosion. It could have been a steam explosion when a hot object hit water. Steve Aplin at Canadian Energy Isues discusses climate change and nuclear proliferation. The Bulletin of the Atomic Scientists thinks carbon sequestration is "immediately deployable" and that nuclear power leads to nuclear weapons. Wrong on both counts. Brian Wang at Next Big Future reports that India expects to have 20,000 MW of nuclear on-line by 2020, and Russia is going ahead with a nuclear ice-breaker and new floating nuclear reactors. Also at Next Big Future, Wang reports that Kazakhstan is slowing down its uranium production until prices rise again. There's so much going on in the world of nuclear power! 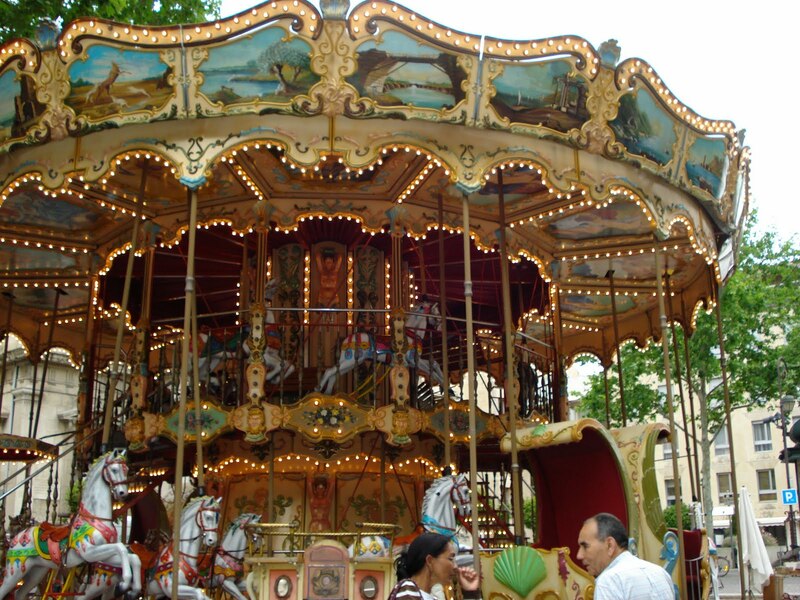 Visit the Carnival and enjoy it all! Some people have sent me copies of their comments to the Vermont Department of Public Service about the Comprehensive Energy Plan. They also gave permission for me to print the comments. The comment period for the plan ends Monday, so get your own comments in as soon as possible. Here's the link for the comment form and email address. Vermonters by nature are not wasters. They don't throw away equipment with usable life remaining. Witness all the old farm equipment and trucks still in service in our heartland. 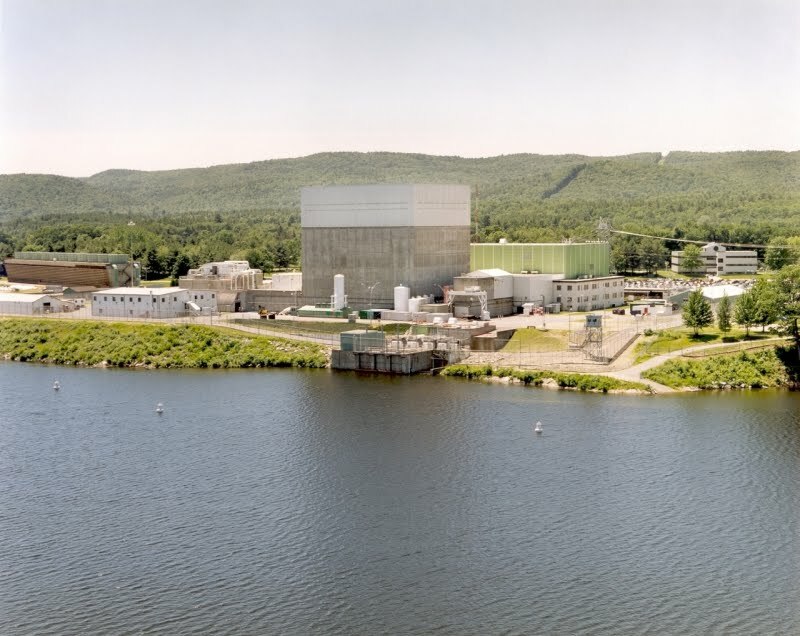 In reading the Department of Public Service (DPS) Comprehensive Energy Plan I don't see anywhere where the perfectly usable Vermont Yankee Plant will continue in service until it can be logically phased out within the extended life period certified by the NRC. The DPS energy plan admits to a gap (page 13) in electric supply before renewables and natural gas can be brought on-line. That is at least 18 years (2030) according to Daniel Yergin, Chairman of HIS Cambridge Energy Research Association in his recent book, The Quest. The other part of the DPS plan is a natural gas pipeline installation which will service only metropolitan areas, and is also years in the making. What do we do in the next decade? The Energy Plan is weak on numbers and timelines. It is more of a statement of wishful thinking, driven by an anti-Vermont Yankee sentiment which permeates the Governor's office. In reading this Energy Plan I don't get the impression that the DPS is proud of it. I do not think they even believe in it. Tell me how my electric rates will stay affordable in the foreseeable future. I cannot believe that the State of Vermont is planning to close down Vermont Yankee and submit its citizens to high cost renewable replacement energy instead. I have been to both an NRC open house in Brattleboro and a tour of the plant in Vernon and have no concerns about the plant. 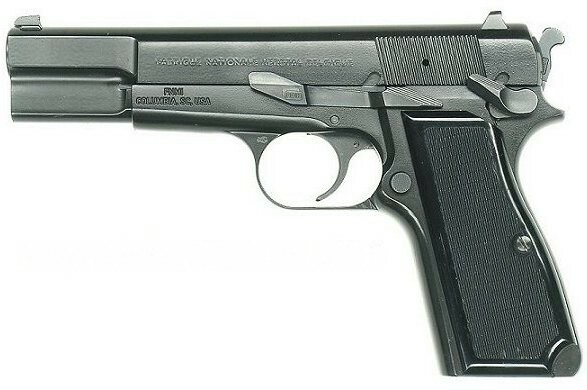 This hysteria about nuclear energy reminds me of the days in the 60’s when I was going to nursing school and there was talk of arming the Emergency Room staff with guns so that in the event of a nuclear accident, the staff could kill people who had been exposed rather than letting them contaminate others. To my knowledge, there has never been a nuclear accident in the US that would have required that action. Yes, they were worried about bombs at that time. The hysteria about the tritium leak is just that. I carry tritium with me all the time on my watch. My request is that we support Vermont Yankee and work to build another plant in the State. That would increase jobs, keep the lights burning and not damage the environment. I bet it would also be less expensive that what you are planning too. You are also ignoring the fact that many Vermonters support wind power but NOT in their back yards. 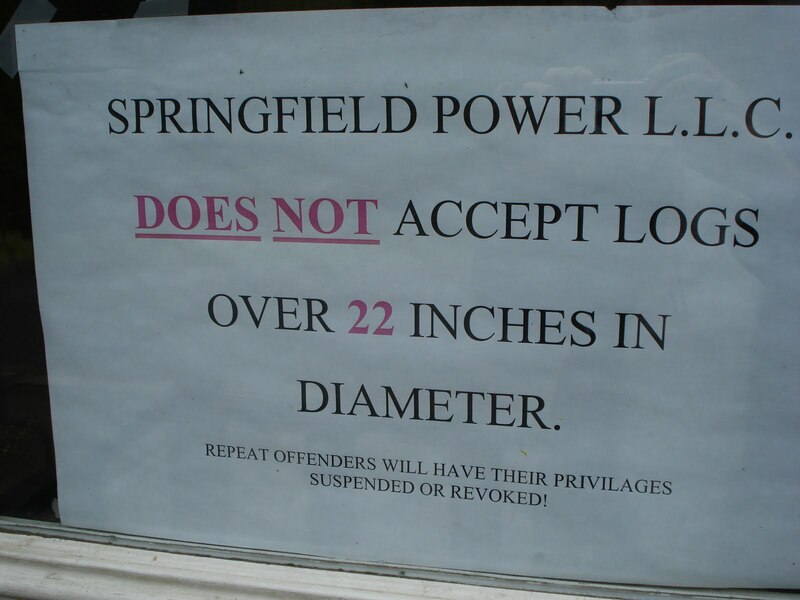 The NIMBY factor. A Former Vermont Senator's Comments: Energy Independence at the Price of Economic Growth? Moving toward "energy independence” by requiring Vermonters to reduce their consumption of imported fossil fuels that now comprise two thirds of the state’s total energy consumption. Strengthening and extending the various mechanisms for effecting these goals: mandates, subsidies, controls, and directives. The most startling omission in this voluminous plan is the complete absence, in section 3.1, of any chart or graph showing the sources of Vermont’s electrical energy now, and the sources we can expect to enjoy in future decades if the Plans recommendations are acted upon. Full disclosure: John McClaughry is the founder of the Ethan Allen Institute, and I am director of the Energy Education Project, which is part of that Institute. This blog post is a slightly edited version of an article I wrote for True North Reports last week. I am grateful to True North Reports for permission to reprint it on my blog. Shumlin, a plant opponent, did not change his opinion of "design date" after the NRC extended Vermont Yankee's federal license until 2032. Instead, he and his team put together a plan for Vermont without Vermont Yankee, the Comprehensive Energy Plan (CEP). The plan was written under the auspices of the Department of Public Service (DPS) and is now going through the public comment process. The CEP covers electricity, heating, transmission, and transportation. It is over 600 pages long, including the appendices. The main volume is 368 pages. Less than a month does not give the public much time to review the documents. The CEP includes ambitious renewable goals, but little actual planning. Among other things, it doesn't address the issue of electricity supply without Vermont Yankee in a straightforward fashion. For example, in the summary document, the electricity section (pages 7 through 9) includes expansion of the standard offer program for renewable energy, and hiring a new "renewable energy project development director" for DPS. The electricity section does not mention natural gas or acknowledge any gap in the electricity supply. However, the home and business heating section (pages 10 through 12) does note that there might be an electricity supply gap. On page 11, the heating section encourages the expansion of a gas pipeline into Vermont because "Natural gas can address two key needs: reduce Vermonter's reliance on overseas oil for heating....and help fill a gap in electric supply." (emphasis added). The CEP contains goals such as 90% of our energy needs by renewable sources by 2050. (page 3 of summary document). There are no numbers or dates for future construction of renewable sources, however. No statements such as "this much wind energy by this date." The CEP does contain a solid recapitulation of Vermont's historic energy demand and supply sources. However, that is not the same as a forward-looking plan. The Institute for Energy and the Environment of Vermont Law School(VLS) recently announced that they had extensive input on the CEP. The Law School input is visible in the CEP. The CEP contains historical data, things to be considered in choosing energy sources, and a great deal about "process" and "stakeholders." However, the CEP is not what an engineer would call a plan. Despite its lack of content, the plan has come under fire from VPIRG (Vermont Public Interest Research Group). Shay Totten, of Seven Days, blogged about VPIRG's early criticism of the plan. VPIRG felt the plan did not move far enough and fast enough about renewables. According to Totten, Ben Walsh of VPIRG did some quick calculations about renewable goals, and fired off an email titled "Really? This is what we waited for?" Walsh pointed out that Vermont utilities added 1.6 percent new renewables under Governor Douglas, and, calculating back from the goals, the CEP calls for only 1.1 percent new renewables per year. Four hours after Walsh sent the email, his boss James Moore wrote an apologetic email: "We are thrilled to have a comprehensive energy plan that shows real vision for where this state can and should go." 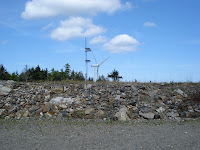 However, Moore noted that "There are parts of the plan that we feel are weak, like the renewable energy requirements." Shay Totten's post has insightful comments on what this exchange means in terms of the usually cozy relationships between Governor Shumlin and VPIRG. It is worth reading. After the Totten blog post, the controversy between VPIRG and the State continued. The Rutland Herald reported that James Moore of VPIRG criticized the renewable energy plan even more strongly about a day later. He claimed that the administration target puts renewable energy growth in Vermont on a slower annual pace than it is on now. Elizabeth Miller, the DPS Commissioner, was also quoted in the Rutland Herald. Miller said she wasn't sure how VPIRG calculated this renewable energy target (number). In my opinion, this controversy was caused by the fact that the plan has long-term goals and few actual numbers. VPIRG was criticizing numbers that DPS did not explicitly put in the plan. As an example, it is worth looking at one chart with plan goals. The following chart on the right is on page 14 of Volume two of the CEP. 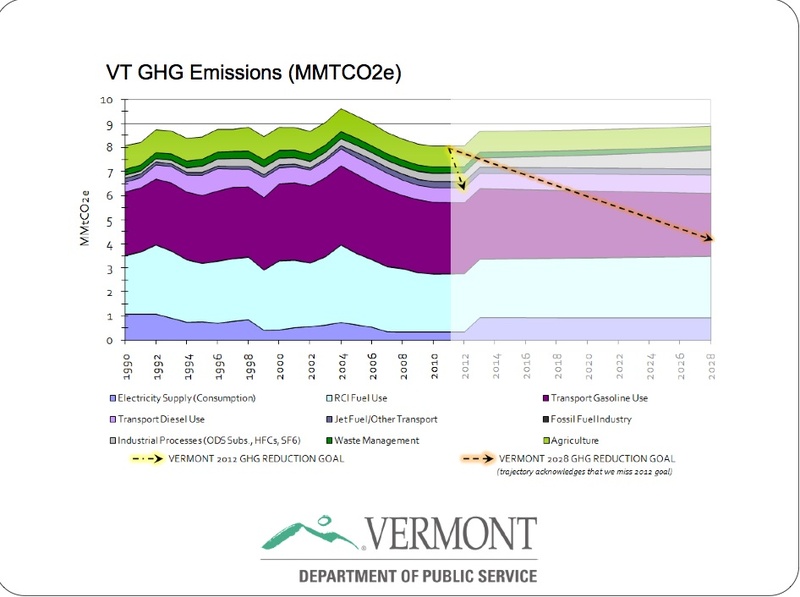 This shows the plans for Greenhouse Gas emissions for the future in Vermont. (You can click to enlarge it). The level of greenhouse gases produced from the electricity sector is shown as rising rapidly after 2012, presumably after Vermont Yankee closes. The chart also shows projections for lowering greenhouse emissions are (at minimum) aggressive, and probably unworkable. It is a chart of goals, not a plan. The one part of the chart that seems grounded in a defined event (closing Vermont Yankee) is the rise in electricity-produced greenhouse gases after 2012. The CEP claims that it does not actually take a stand on Vermont Yankee. On page 150 of volume 2: This plan will not take a position on whether VY should continue to operate; that is the role of state laws and processes and is the subject of the pending lawsuit. However, since the impetus of writing the plan was to have an energy plan without Vermont Yankee in the mix, this statement is a bit disingenuous. For example, a recent editorial about the plan in the Burlington Free Press notes that: Given the governor's history, no one should be surprised that nuclear energy -- Vermont Yankee in particular -- has no long-term future in the Shumlin plan. 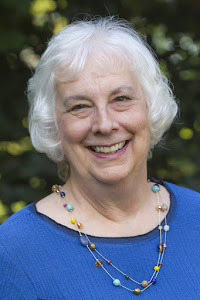 Note: A Burlington Free Press article by Nancy Remsen: Vermont Faces Up to Energy Challenge gives an excellent overview of the plan, particularly the home heating (natural gas and wood) and transportation (electric vehicles) section. Full disclosure...I am quoted in the article. You are asked to address only one energy topic per comment (electricity, conservation) but you can submit multiple comments. Or you can use the email address to comment. These electronic forms are probably the best ways to comment, though there are public meetings on October 3 and October 6, also. The CEP approval process is moving forward rapidly. The length of the CEP documents and the shortness of the comment period are somewhat intimidating. Still, it is possible to comment, perhaps by choosing one area of the plan. Citizens interested in Vermont's energy future should comment. As citizens, we have an obligation to have our voice heard. 72nd Carnival of Nuclear Energy Bloggers at Yes Vermont Yankee: International Builds, Domestic Issues, and What Do You Do With the Wolves? Yes Vermont Yankee is privileged to host the 72nd Carnival of Nuclear Energy Bloggers. Let's start with some good news. There's nothing like looking at the international scene to cheer a person up! Jeff Madison of Cool Hand Nuke describes the biggest nuclear power station in the world. In UAE reactors to break ground in December, Jeff features a Dan Yurman post about the build in the United Arab Emirates. Construction of four new 1,400 MW nuclear reactors worth $20 billion, supplied by South Korea, will begin at Braka as early as this December. The actual date will depend on regulatory approval. The first of the four new units will come online in 2017 followed by the others through 2020. Brian Wang of Next Big Future shares two pieces of good news, from France and from Japan. France has ordered new steam generators to extend the lives of the nuclear plants from 40 to 60 years. Meanwhile, the Fukushima plants near cold shutdown, with pressure vessel temperatures below the boiling point of water. 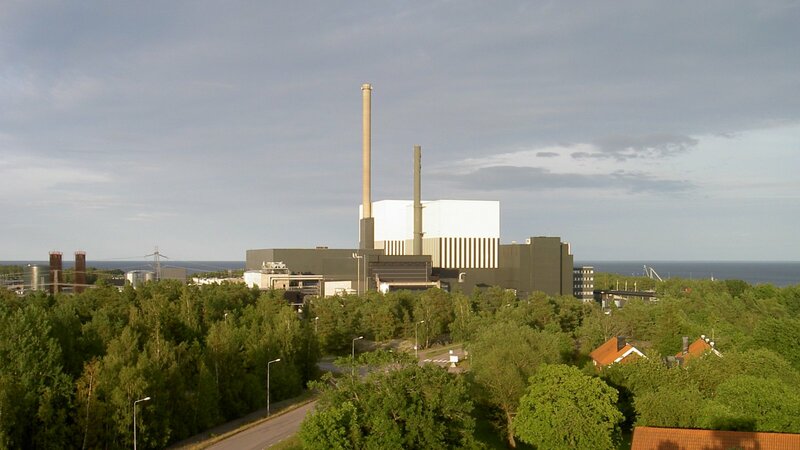 In another post, Wang notes that the Oskarshamn plant in Sweden has finally completed its 250 MW power uprate. It is the largest BWR in the world. In the same post, he updates us on one of the Chinese builds, scheduled to go on-line in 2014. The dome is now in place. But what about Scotland? They backed out of the nuclear renaissance recently, didn't they? In Scots Drop Out of UK Nuclear New Build, Dan Yurman of Idaho Samizdat analyzes the numbers, not the rumors. Yurman notes that lot has been made of the fact that Scottish & Southern pulled out of the U.K. new build. 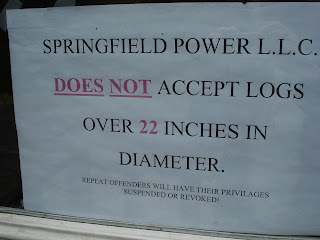 After looking at the numbers, it becomes clear they were hardly even in it to begin with. Claims by green groups that their actions represent a setback for new reactors in the U.K. are not supported by the facts. The company plans to go back to their core business: natural gas plants fueled by the fields of the North Sea. Oh, yes, they will build wind turbines, too. While we are looking internationally, we must tip our hat to Rod Adams, who doesn't shy away from the big issues. 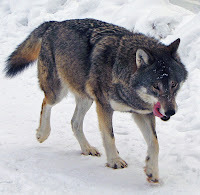 In Radioactive Wolves, Coming to PBS Nature on October 19, 2011, Rod looks at Ukraine and Belarus: Chernobyl. One of the persistent propaganda myths about using nuclear energy is that hypothetical accidents can release radioactive material that will render vast areas of land uninhabitable for centuries. It is a good thing for wolves, deer, and boars that they cannot read antinuclear propaganda or watch television. If you want to understand a little more about the actual environmental conditions just 25 years after a catastrophic nuclear plant accident, tune in to PBS’s Nature program on October 19, 2011 and watch Radioactive Wolves. Unfortunately, all the posts about the domestic scene are basically about the Government and Its Role in Nuclear Power. Well, we soldier on. At least our bloggers have good insights into the problems. In Nuke Power Talk, Gail Marcus looks at Solyndra: What It May Mean for Nuclear Loan Guarantees. She considers the bankruptcy of Solyndra and contemplates the effects it could have on other industries. The nuclear power industry is also in the Federal government's loan guarantee program. This business failure will not cause renewable advocates or nuclear advocates to rethink their positions, but it may cause the government to decide that all loan guarantees are a bad idea. In The Neutron Economy, Steve Skutnik posts the second part of his analysis of the Blue Ribbon Committee recommendations. Dissecting the BRC Report Part II: Where Interim Storage Falls Short. While the BRC provided useful guidelines for situating an inevitably necessary geologic repository, their technical recommendations for waste management fall short for a number of reasons. Their recommendations depend on interim storage, which may be useful at buying time for waste management policy. However, the BRC report's conclusions ultimately rely on a deus ex machina approach, waiting for as-yet nonexistent transformative technology to come and solve their problems for them. 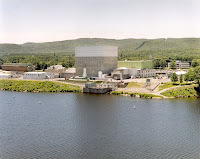 At Yes Vermont Yankee, I report that Governor Shumlin does not give our nuclear plant even the most minimal level of credit for its service to society. In Taking the Petty Road: Governor Shumlin, Hurricane Irene, and Entergy's Charitable Donations, I note that Governor Shumlin gave the press a list of business "angel donors" who contributed large amounts to disaster relief after Hurricane Irene. He included several companies who gave far less than Entergy (Entergy gave $130,000). Shumlin left Entergy off the list. So I'll include my blog post about the Energy Safari visit to Lempster Wind Farm, which has plenty of pictures, as well as some interesting information about wind. But how do we get our reactors in place? Charles answers this question in Transporting Small Factory Built Reactors and Modular Components. Both highway and rail transport of reactor units and reactor modular components will create problems for reactor mobility. At the same time it appears possible to truck transport core units for MSRs of up to 100 MWe. The SM MSR modules could be locally delivered by barge or ship, and then moved to their final locations by truck or by rail. Thus the cost savings potential of factory manufacture of reactors is an open possibility. Hope you enjoyed the Carnival! 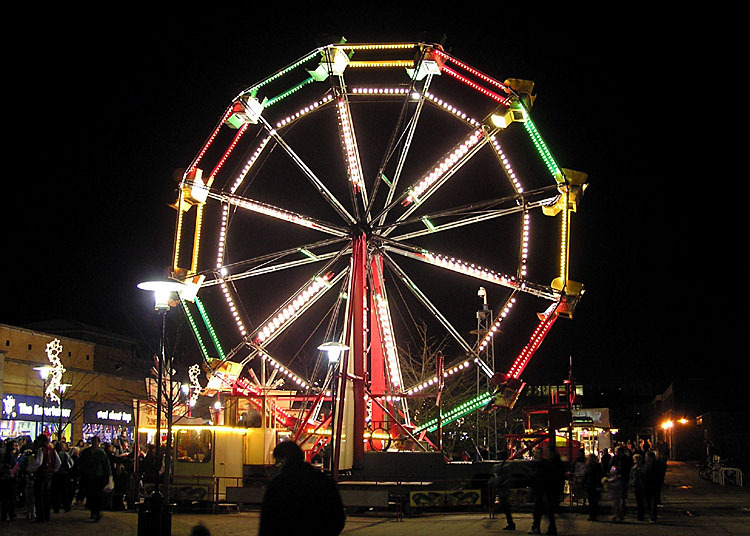 Next week, the Carnival will appear again--at Next Big Future. Stayed tuned!